The "Little Five": What Are The Little Five Animals of Africa? 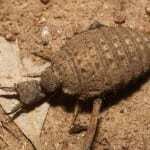 The Antlion is the smallest member of the “Little 5” club – known as a doodlebug in America because of the patterns it makes in sand – and found predominantly in sandy, arid areas throughout Africa. The Antlion has a wide body and large jaws, and is the larvae stage of a flying insect known as the Antlion Lacewing that looks similar to a dragonfly. Antlions dig small funnel-shaped sand traps about 2 inches deep in dry, sunny spots – particularly on south-facing slopes – and wait at the bottom of it covered in sand so that only the head is protruding. Ants are their primary prey, hence the name. 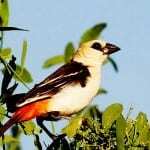 There are two species of Buffalo Weavers, the Common Black Buffalo Weaver, or White-headed Buffalo Weaver. Both species are large for weavers, and grow up to nine inches long. Buffalo Weavers are found in dry areas and are very common in East Africa where their diet is made up of small grass seeds, insects, and fruits. Buffalo Weavers make the poorest nests of all weavers – building large, communal nests of sticks and thorns with several side entrances. They’re a social bird with a wide range of easily identifiable calls. Elephants Shrews are named after their long trunk-like snouts which are flexible and used to sniff out insects to eat. They grow up to 30cm long, and have relatively long legs which give them the ability to hop around – reportedly up to 3 feet in a single bound. 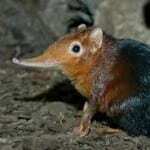 Elephant Shrews are common across arid and wooded parts of Southern Africa and mark their territory with a scent produced by a gland under their tail, though are shy animals and not frequently seen. Leopard Tortoises are named after the striking leopard-like pattern on their shell. Young Leopard Tortoises have a dark brown or black pattern, and as they mature the spots get smaller on the hard, bumpy shell. 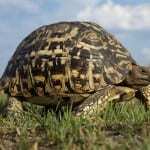 As with most tortoise species the Leopard Tortoise are able to draw their head, tail and legs into their shell for protection. Leopard Tortoises live across East and Southern Africa in savannah habitats and are herbivorous, eating grass and succulents. Found across Southern Africa the Rhino Beetle is a large insect that’s part of the scarab beetle family – with extraordinary body armor. The Rhino Beetle larvae can take up to five years to mature into an adult. Growing up to 2.5 inches long the male Rhino Beetle has a large horn it uses to fight other makes – hence the name. Rhino Beetles also use their horns to dig for food in the undergrowth or rotting wood and have a diverse diet including rotting fruit, bark, sap and vegetable matter. 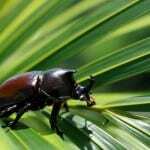 Proportionally to their size, Rhino Beetles are among the strongest animals in the world. 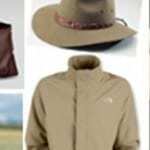 Have you seen the little five whilst on safari? Let us know your experiences by joining in the conversation in the comment below. 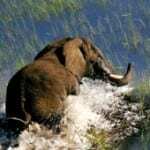 I did not know about the little five not until I was guiding clients in Queen Elizabeth National Park, Uganda. We saw a buffalo swallow and I was inspired as a ranger guide! I did not know about it at all but my client made me understand what it was.